Happy new Homeowners in Sandy Point along with PM Harris, Deputy PM RICHARDS and Minister of Housing Hon Eugene Hamilton and others. BASSETERRE, St. Kitts, THE National Housing Corporation today (June 13) continued with its mantra of providing affordable homes to people in need when they distributed the keys to 15 of 16 new homes in Stadium View, Sandy Point. The distribution forms part of a three-day exercise undertaken by officials at NHC to distribute homes that are completed to successful applicants. On Tuesday, officials from NHC, government representatives and members of Cabinet, including Prime Minister, Dr. Timothy Harris distributed the keys to 16 new homes in the Old Road area. In distributing houses today, Prime Minister Harris was joined by Parliament Representative for the Sandy Point area, Deputy Prime Minister, and Minister of Education, Shawn Richards who assisted in the key distribution. Minister Richards in expressing his pleasure for the homeowners posited that history was being made for the people of the district. 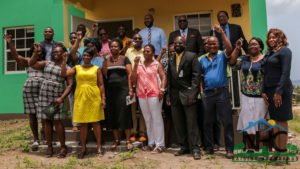 While commending the National Housing Corporation for the work that was undertaken, Richards charged that those contractors that undertook the work can use the homes as a model for what they can construct for future houses. Additionally, he revealed that many gained empowerment in the construction process including the contractors, noting that many of them were from the Sandy Point area. General Manager of NHC, Elreter Simpson-Browne, reiterated that the Corporation continues to go above and beyond when it comes to providing adequate shelter for the people of St. Kitts and adding to the existing housing stock. “Today is indeed a testimony, as you can see the ten beautifully constructed bungalows that are before us. In addition to these, we have also constructed in this constituency an additional five houses from individual lots, which forms part of our building assistance programme,” adds Simpson-Browne. PM Harris gave commendation to the new homeowners, stressing that his government is one that is caring and hearing from the people. 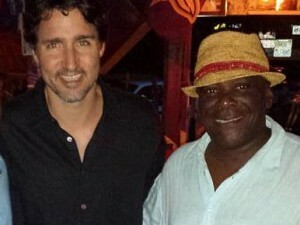 He added that they understand and are responding in thoughtful ways to improve the quality of life for all the people of St. Kitts and Nevis. The construction of the houses forms part of a $50 million loan provided by the Social Security Board to construct 300 homes across St. Kitts.